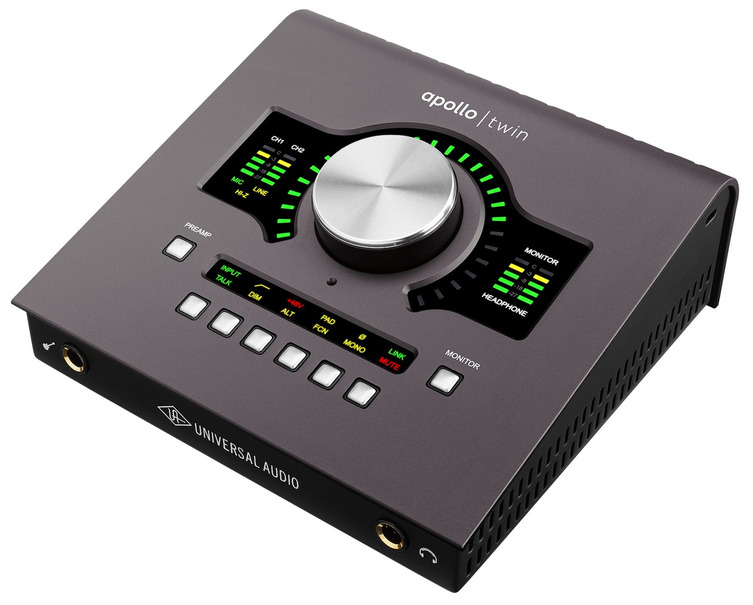 The Universal Audio Apollo Twin Duo MKII features a completely new design, with the next-generation Apollo A/D and D/A conversion revamped for improved dynamic range ultra-low THD. The 2x6 Thunderbolt configuration delivers exceptional clarity and depth when it comes to your recordings, retaining the natural harmonic qualities while bringing out the best from your source material. The clarity and warmth of the Twin Duo MKII can be found on hit recordings from Coldplay, Kendrick Lamar and more. The Dual realtime DSP on-board processors provide exceptional audio performance, allowing you to use a wide range of plug-ins, opening up a range of options for analog sound and added colour. The exterior of the interface has also seen a redesign, with its same familiar configuration now housed in a sleek, dark-grey finish that will match any studio setup. Apollo Twin Duo MKIIâ€™s Unison technology produces one of the most sought-after tones in the world, delivering the authentic analog warmth and sound normally reserved for tube and transformer-based microphone preamps. The attention to detail brings out the best from your recordings, utilising the signature impedance, gain staging and component-level circuit behaviours to deliver the best possible audio performance on the market. The Unison technology lets you record at near-zero latency through a range of preamp emulations such as the UA 610-B Tube Preamp (included). The resulting tone is an authentic analog sound unmatched by other audio interfaces. The Unison technology is also found on the front panel Hi-Z instrument inputs, providing the best impedance and gain matching for guitar and bass amp models for the most popular manufacturers. 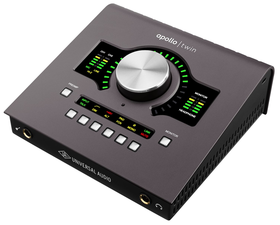 The ergonomic layout of the Apollo Twin Duo MKII, Thunderbolt is designed to improve your overall workflow as well as the monitoring functionality. New Mono, Mute, DIM and ALT monitor controls have been included, streamlining your monitoring process. A built-in talkback mic also allows you to communicate with your recording artists, allowing you to give them cues and other instructions on the fly. The unique scalability of UAD devices means you can combine up to four Apollo interfaces and up to six UAD-2 devices in total, allowing you to expand your I/O and DSP to meet your needs. Additionally, the Apollo Twin MKII comes complete with the Realtime Analog Classics UAD Plug-In bundle featuring Legacy version of the LA-2A Classic Audio Leveler, Pultec EQP-1A EQ, 610-B Tube Preamp EQ and a whole lot more. This wide range of studio-grade effects allows you to further improve your recordings, adding subtle overtones and compression as you require it.